In a round-about way, the disastrous star-studded 1980 cinematic adaptation of Agatha Christie's brilliantly conceived novel The Mirror Crack'd from Side to Side may have inadvertently been responsible for the success of Murder, She Wrote . Namely, the series creators modeled Murder 's senior sleuth Jessica Fletcher off of Christie's Miss Marple character whom Murder star Angela Lansbury had played four years earlier in director Guy Hamilton's The Mirror Crack'd . Furthermore and comparatively speaking, Jessica Fletcher was a far better homage to Christie's beloved Marple mysteries than the original Mirror Crack'd , which was easily overwhelmed by the excess of egos run amok as all of the baggage and drama embodied by legendary screen sensations Elizabeth Taylor, Kim Novak, Rock Hudson and Tony Curtis dominated the ingenious twists and turns of the source material. Fortunately, thirty years after the campy Columbia Pictures spin was unspooled to the unsuspecting masses, ITV Global unveiled their own masterful adaptation of Christie's classic as part of their acclaimed, long-running Marple series of high quality stand-alone 1950s period pieces. Following its summer 2010 American premiere on PBS' Masterpiece Mystery!, The Mirror Crack'd from Side to Side was gorgeously transferred from small screen to Acorn DVD , wherein it kicks off the set's trio of impressive mysteries plus a bonus biographical documentary disc about the country home and garden retreat cherished by the Queen of Suspense. Although she had some daunting shoes to fill, sweet-natured Julia McKenzie remains a worthwhile successor to former leading lady Geraldine McEwan, skillfully picking up the knitting needles to become what one may initially assume is simply an unassuming friendly spinster in Miss Jane Marple. 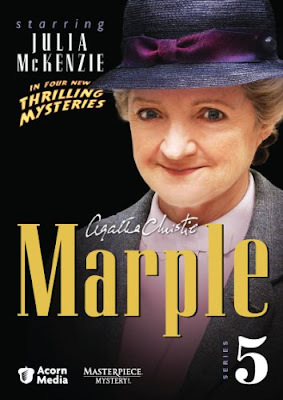 Nonetheless and despite the fact that she doesn't have Hercule Poirot's bravado or gender advantage of being a man in a sexist and ageist society, Marple consistently reminds viewers that they should never judge a woman by how much tweed she wears or scarves she knits. From Mirror Crack'd all the way through this set's other installments of The Secret of Chimneys and The Blue Geranium, Marple frequently unravels the tangled remnants left behind before stitching together conversational threads shared in confidence, beautifully weaving us through the diabolical yarns that have baffled the best of Scotland Yard. While Crack'd is the standout due to the enviably tricky denouement, all three highly entertaining installments are superb from a mystery standpoint. Admittedly however, because of a slightly confusing, chronologically challenged and therefore structurally ineffective first act that perhaps stems from the fact that the work was adapted from a short story rather than a fully fleshed out and methodically paced novel, Geranium takes awhile to hook us in stark contrast to the previous titles. Similarly while Geranium is the easiest one of the three tales to unravel at Marple speed, again most likely because it needed to incorporate the clues of the short story in certain key places, it manages to entice us in a whip-smart, multi-layered final act as par for the course, Christie drops a few red herring stitches and throws us for yet another magnificent loop. The works are lovingly brought to life with stunningly cinematic production values including exquisite art direction, costuming and Marple-like attention to detail, which is particularly apparent in the moody middle case The Secret of Chimneys, which – much like Murder on the Orient Express and Mousetrap , for example – reminds us just how eloquent Christie can be when puzzling out a case that takes place for the most part in one dominant location that ups the sense of claustrophobia and urgency. Moreover, it's worth noting that this highly recommended fifth collection additionally features another kind of whodunit. Boasting a stellar line-up of guest stars like Lindsay Duncan, Caroline Catz, Joanna Lumley, and Caroline Quentin whom avid Acorn DVD collectors are sure to recognize from lighter fare like Doc Martin to Christie influenced titles like Blue Murder , we're reminded that just like Lansbury's Jessica Fletcher , the childless Marple has defied first impressions once again by producing generations of diverse female sleuths.